The recipe I am sharing today is from the special Southern Cakes issue of the magazine, available on newsstands now or you can purchase it online by clicking here. This is a decadent Carrot Cake, made from scratch, just in time for easter! Enjoy (and save me a slice)! Preheat oven to 350°. Spray 3 (9-inch) round cake pans with nonstick baking spray with flour. Line bottoms of pans with parchment paper; spray with nonstick baking spray with flour. Set aside. In a large bowl, stir together flour, sugar, raisins, walnuts, cinnamon, baking powder, baking soda, salt, ginger, and nutmeg. Add carrot, pineapple, eggs, canola oil, and vanilla; stir together until well combined. Divide batter evenly among prepared pans. Bake until a wooden pick inserted in center comes out clean, approximately 25 minutes. Let cool in pans 10 minutes. Remove from pans, and let cool completely on wire racks. Spread Cream Cheese Frosting between layers and on top and sides of cake. Refrigerate until ready to serve. In a large bowl, beat cream cheese and butter at medium speed with an electric mixer until smooth. Beat in vanilla. Gradually add confectioners’ sugar, beating until smooth. If you’d like to subscribe to Taste Of The South, I have a column and a full menu in each issue, AND I’ve got a special discount code for ya! Enter the code “Taste” at checkout for $5 off! You can subscribe online by clicking here, don’t forget to use that code! 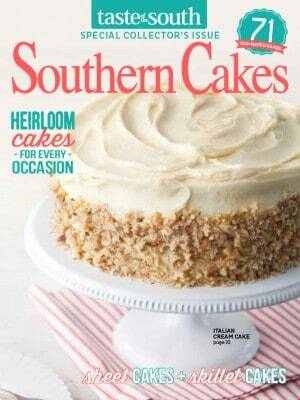 You can also purchase a copy of Southern Cakes online or on newsstands now. If you’d like to purchase it online and get 20% off of that, click here and enter the code “Cakes”. Note, it looks like you can only use one code at a time (I tried it for ya) BUT first class shipping is free so you can go through checkout twice and get both discounts and still pay no shipping in the United States. You are going to LOVE these magazines! Christy, Is it safe to assume that this could be made in a 9X13 pan as well? I really struggle with layer cakes, they never seem to stay together or look as pretty as the pictures. I tend to go for the easy, one pan version! Thanks for all the wonderful recipes! Happy Easter! I love to make cakes, and like the presentation of layer cakes if I am taking it somewhere, but sometimes it’s easier to just have something that you can bake, frost, store and serve all in one pan. This is a big cake recipe and for me personally, a 13×9 pan makes the cake layer too thick and the frosting seem too thin. I have a sheet cake pan with a lid (18×13) and I love it. I bake my carrot cake, Italian cream cake, hummingbird cake, red velvet and German Chocolate cakes in it. It has the right thickness of cake to frosting ratio! LOL I bought it on Amazon.com years ago, it is made by Nordic ware. It is very inexpensive and I wouldn’t be without it. You just adjust the baking times of the cakes. They still sell it, it is like $18. It is high sided so it can be used for really large cake recipes or even regular ones, if you are like me and like a thinner cakes. Is there a special camera or lens that is used to get these great shots? Try as we might, folks at home never can duplicate these food pics! There are some special lenses that you can buy Baltisraul, but the biggest thing is the lighting, it makes a bigger difference than any lens could. Love carrot cake will be trying this recipe. I hope you enjoy it Kay!! I have also found that you can use puréed baby food carrots instead of fresh, makes it really extra moist and somewhat easier. Oh wow, hadn’t thought of that, thanks for sharing your tip! I noticed at the bottom on your March archives you have 2008-1015, you may want to correct to 2015? LOL! Btw, I live next door to Bill and Janice Posey, Sarah Jane’s grandparents, who are fabulous neighbors! I have tried quite a few of your recipes and have enjoyed each one. Oh my goodness, they are just wonderful people and we love Sarah Jane dearly!! Hi Christy, I would also like to use A 9×13 pan cakes made with these pans and bundt or tube pan works very well for me,may I use A tube pan for this carrot cake .Thanks God bless. Wow that looks yummy! I was wondering if there is a good substitute for pineapple though as I’m allergic to it. You know, this may sound out there but my first thought was drained mandarin oranges! Try using applesauce. A regular 14 to 16 oz can or jar will work. I have made this for my father in law as he is allergic to pineapple also and it is wonderful both ways. I hope you enjoy it Melinda!!! Have a Happy Easter!! I am making this for dessert with our Easter dinner. I was looking for something special and here it is. Thanks again, Christy. I hope you enjoy the cake and have a very Happy Easter Tom!!! Thanks for posting this recipe. 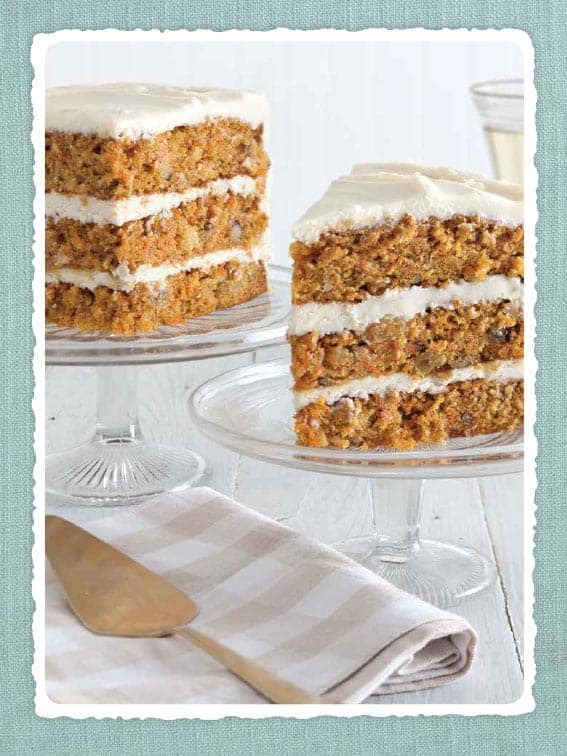 I love made from scratch Carrot Cake and cannot wait to make this for my family! I hope you and your family enjoy it and have a very Happy Easter!! Christy, I have made this cake and substituted 2 to 3 jars of Gerber “junior” baby food carrots and it saves all that shredding and comes out so moist and just as delicious while saving time, and I’m all about saving time and money. Great tip Cathy!! Thank you so much for sharing! I love carrot cake thanks for the recipe. I will make it for EASTER Have a blessed EASTER Sunday u an your family. I hope you and your family have a blessed Easter Agnes!!! 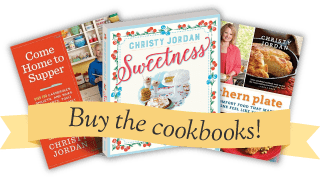 I am so excited thank you for putting the link to a subscription to Taste of the South in your post. I am now going to be eagerly watching for my first magazine to arrive in the post and looking forward to reading your column and seeing the menu you have chosen. I like to have a whole menu put together and loved the ones in your magazine the Best of Southern Plate so I am just totally excited thank you Christy God bless you. Thank you for subscribing Judi!! I hope you enjoy my column!! You have a magazine titled “The Best of Southern Plate”? Can I buy it at Walmart or Kroger? Just wanted to share a great tip to all that shredding. Do you remember the salad shooter? That is what I use and, my word, is it fast! You are done in not time at all. Take the shooter apart and put in your top shelf of your dishwasher and done!!!! Oh wow!! Great idea Jan!! Made this cake yesterday and it was very delicious! I added about 1/4 cup of shredded coconut. This recipe is definitely a keeper. I am so glad you liked it Janeen!!! Hope you had a Happy and Blessed Easter! How high does each layer come out to? How high are the layers? I am so excited to try this recipe. My standard for carrot cake is pretty high since finding my love for this cake at a bakery in Idaho. Sadly that bakery closed and I have not found a carrot cake I enjoy that much. I did notice that you don’t have coconut in your recipe. Is there a reason for that? Can I add it? I know its a texture thing for some people but I have always known it to be in the cake. Thank you. Yay! glad to see what’s going on in Panama; in your about you, you didn’t mention how you came to live there…are you from there? (if so, your English rocks–I can’t inmaige blogging in a second language!) Also, are you on goodreads.com? It’s my fave for book ideas and getting reviews of what to read next. My husband doesn’t like raisins. If I leave them out do I need to add something else in! If someone doesn’t like walnuts can I skip them ?? Thank you. And I have one more question. Can I skip the pineapple?